My favorite type of work is anything that allows me to give back to my community. I’m thrilled to be a part of Alta and to have the opportunity to contribute to the creation of communities that are accessible, active, and safe. Nora Hastings is a graphic designer with a passion for public-facing information. 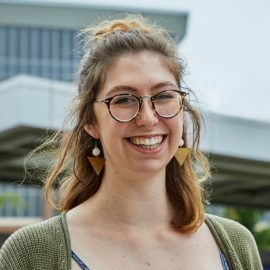 Nora’s past experiences include working for Metro Transit (the public transportation agency for Minneapolis and St. Paul) and the student advocacy group at the University of Minnesota Twin Cities, where she completed her undergraduate degree. When she’s not working, Nora enjoys exploring the city, talking about her cats to anyone who will listen and hiking trips that are immediately followed by an unreasonable number of tacos.